Do you or your child need dental sealants? First let’s define sealants. 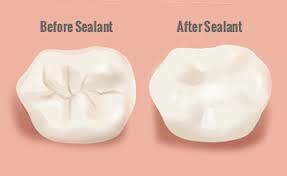 A dental sealant is a thin coating applied to the chewing surface of the teeth to fill in deep grooves and prevent tooth decay. Dental sealants are tooth colored and look natural. Sealants can be applied to both children and adults. However, to have the best chance of preventing decay, they should be applied as soon as the teeth are fully erupted in the mouth. First molars erupt around age 6 and second molars erupt around age 12. Patient compliance should also be considered when deciding when your child gets sealants. If your child does great at the dental office and is able to stay still, that is a good indicator they will be able to tolerate getting sealants well. Sealant application does not require any numbing or shots and usually takes less than an hour. It should not be a traumatic experience for your children, however it does require that they are able to hold their mouths open, stay still, and have a few different instruments in their mouths. The first step in applying dental sealants is etching the tooth. Think of etch as a powerful soap for the tooth. It cleans the surface about to be sealed and allows the sealant material to bond to the tooth. Etch is applied for 30 second, and then rinsed off. Next the sealant material is carefully applied to the grooves of the tooth and bonded with a curing light. The light hardens the sealant material into the grooves of the tooth sealing it off from bacteria which cause tooth decay. Finally the sealant is checked for a solid seal into the tooth, ensuring it is a good fit, properly bonded and not too high in the mouth. If need be, your dentist can adjust the sealants to make your bite feel natural. Sealants can be applied to any posterior teeth, bi-cuspids and molars. Research shows that unsealed molars have a 95% chance of developing a cavity at some point in a person’s life. Sealants are one of the best preventers of tooth decay. To read more about dental sealants, check out the ADA’s Mouth Healthy Page. We are happy to answer any questions you may have! Call Adams and Cheek Dentistry today at (919)866-1360 or click here to schedule an appointment online.